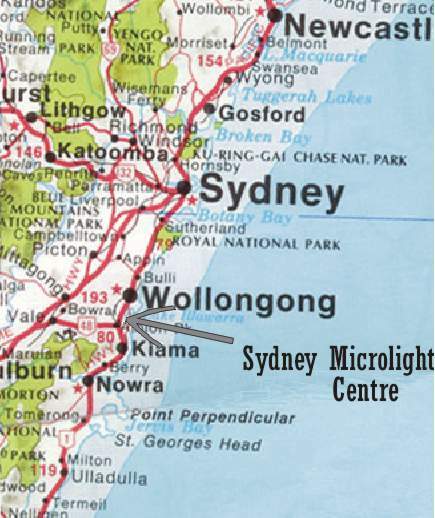 DIRECTIONS: Follow the M1 motorway (formerly known as the F6 Freeway) out of Sydney to Wollongong. Do not take the Wollongong turn-off, but continue on for a further 10 minutes until you get to Albion Park Rail (about 22Km south). The speed limit changes from 100 to 70 just before the end of the M1. You'll come to a roundabout, but stay on the left side of the road and stay to the left of the roundabout. Continue along the road towards Albion Park Rail shops and as you do you will pass 2 service stations (a Caltex and a BP, both on the left). About 250 metres after the BP you'll see a set of traffic-lights. Turn right into Airport Road at these lights ( a signpost says "Airport", and the lights have a right-turn arrow). You're nearly there! Go straight through the next roundabout you come to and follow the road which will veer around to the left. As it does, you'll see a pale yellow hangar to your right. On it is a sign with the letters "CB" in black and white. There's also dark blue security gate. Stop here and turn hard left and park on the grass opposite the blue security gate. Our office is just inside the security-gate and to the right, the building has a pole with a TV antenna on one end. Come up the steps and inside - you've arrived! 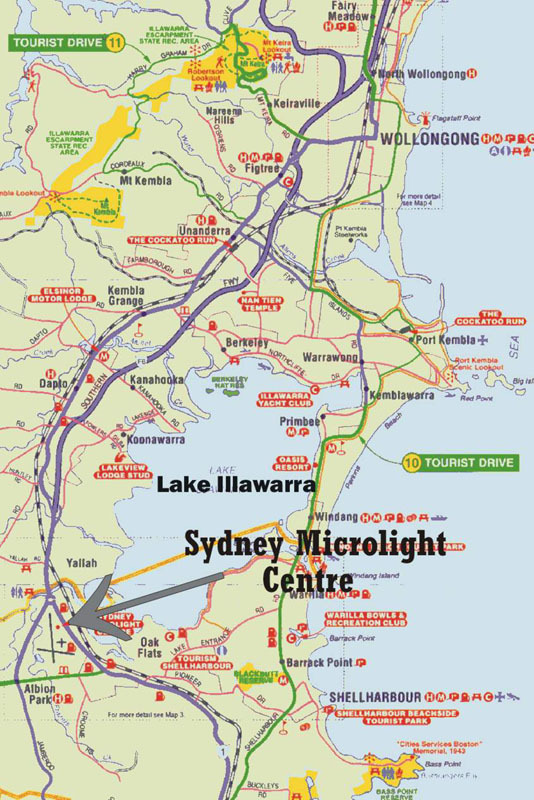 Please Note: Tthe Sydney Microlight Centre will be closing officially as of 30th June 2018, unless a new operator can be found to take the business over.